Home » Posts tagged with "rules and guidelines of floral float competition in kadayawan 2012"
The highly-anticipated 27th Kadayawan Festival (2012) in Davao City (considered to be the Festival of Festivals in Mindanao) is fast approaching and while there is no official list of schedule of events yet, the city government of Davao has already released the official rules and guidelines for the Floral Float competition (Pamulak Kadayawan) – one of the highlights during the Kadayawan season, which is an annual event held in the month of August. The Floral Float Parade competition is participated by different sectors of society, including local businesses, non-government organizations and civic society, and the lumads. Any person, group, organization, institution or company can join the competition. Big Category – MINIMUM SIZE of float is 6 feet in width and 12 feet in height, including base. Small Category – Anything BELOW 6 ft in width and 12 ft in height including indigenous or extraordinary small vehicles or contraptions which is motorized. Entries may also include but not limited to minica cars, golf carts, mini tractors, and pedicabs. Non-motorized 2 wheel category – Small contraptions on two wheels not motorized and either be manually or animal driven, including but not limited to, push carts (kariton), karo, kalesa, etc. Entries for non-competing floats that lead to promote a product or commercial business/firm for the different categories should be assessed at the following rates:Big Category – P20, 000.00Small Category – P10, 000.00Non-motorized 2-wheel Category – P5, 000.00Entry fees shall be paid directly to the Office of the City Treasurer on or before August17, 2012. Payments in check must be made in the account name of the City Government of Davao. All payments shall accrue exclusively to the trust fund account. The maximum height for all floats shall be 12 feet from the ground to avoid entanglement with the buntings and the electric wires. Floats should be stable and secure and must be well-ventilated to avoid suffocation of driver(s)/rider(s). The required maximum dimensions for the float is 8 feet with x 12 feet length. The vehicle that will be used for the float should be in good condition. 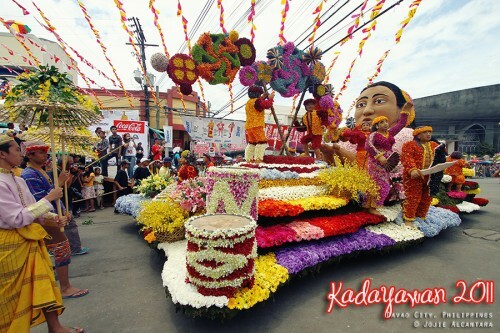 Competing floral floats should adopt the general theme of the Kadayawan Festival which is the celebration of life, thanksgiving for the gifts of nature, the wealth of culture, and the bounties of harvest. Competing floral floats shall use at least 80% fresh flowers, plants, fruits, or vegetables as a medium, while non-competing entries are required to use at least 20% (the floral float parade committee shall determine for the judges the participants compliance on this criterion). Floats that do not meet this requirement will be disqualified from the competition, if competing or barred from parade participation, if non-competing. All participating contingents in floats should be at the assembly place along Roxas Avenue between 5:00 to 5:30 AM. Floats that do not arrive at the said time shall be positioned at the last order of the parade. Judging of entries shall be on the day of the parade August 19, 2012 (Sunday) and shall start at exactly 7:00 AM. Route of the parade starts at Roxas Ave., turns left to C.M. Recto St., turns right to Bonifacio St., turns left to Legaspi St. (Pelayo ST.), turns left to San Pedro St. to cross the main judging area in front of Rizal Park. Participants should submit a copy of the description and explanation of the float’s symbolism in not more than 120 words not later than July 31, 2012 (Tuesday). The description and explanation shall be read during the actual day of the parade as the float approaches the end point of the parade route. Taped summaries will not be accepted. Initial meeting is on July 19, 2012 (Thursday). The Pamulak parade contestants will draw lots for the sequence of the floats and street assignments for assembly purposes during the final briefing of all parade participants. Final briefing will be on August 11, 2012 (Saturday) at 10:00 AM. Venue to be announced later. The Pamulak Parade Committee shall carefully select a panel of five (5) judges. Their decisions shall be considered final and therefore not appealable. The Pamulak Parade Committee reserves the right to disqualify any entry that fails to abide by th stipulation signified in this guideline. Throwing of candies, cigarettes, towels, fans, caps, or any form of promotional materials/giveaways that can distract the flow of the parade. Participation in the parade for the purpose of promoting a certain candidate or political party in the coming election is strictly prohibited. Floats, banners, posters, streamers and other materials that promote a certain candidate or political party will be confiscated, or if necessary, the participating group responsible for the act will be removed from the parade line. Symbolism (20%) – The entry should project and symbolize the meaning of the Kadayawan. Design (40%) – This pertains to the concept and artistic merits of the design taking into consideration Balance, Proportion, Emphasis, Harmony as primarily reflected in shapes/images and colors. Implementation (40%) How the design is realized and how the float is made are the focus in this criterion. For considerations are quality of craftsmanship, stability of structure and decoration, choice and creative use of materials. All competing floats have to stand by for display and public viewing at Roxas Avenue from 1:00 to 3:00 PM after the parade.